We were on an expedition to Wakodahatchee Wetlands and Green Cay Wetlands, both man-made wetlands and water reclamation facilities for the county, and both wonderful spots for photographing birds. In mid-July, there were plenty of Moorhen (Gallinula chloropus) chicks like this one, as well as the young of many other species. 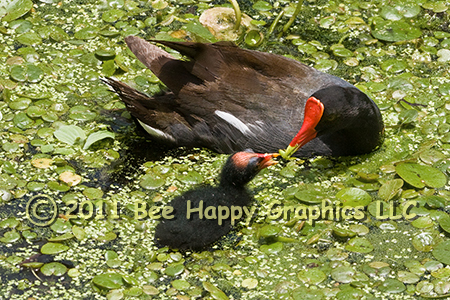 Although sometimes it appeared that an older sibling would care for the baby moorhens , this one was sticking close to its parent. Photographic details: Canon EOS 30D camera w/ EF 100-400mm f/4.5-5.6L IS USM lens set at 210mm. Flash was not used. Camera was set for f/13 on aperture priority, resulting in a shutter speed of 1/640 sec at ISO 800. Fine Art Paper 11" x 14" 111/2" x 16"
Canvas N/A 121/2" x 18"